Primarily known for her supporting role as The Bowler in the 1999 action-comedy Mystery Men, Ms. Garofalo has traded in her bowling shoes for football cleats and is finally making a name for herself. Look for her to follow in the footsteps of her hero Tom Brady by promptly replacing him the moment he slows down. Sam Bradford aims to make the Minnesota Vikings vaguely interesting this year after the loss of Adrian Peterson. 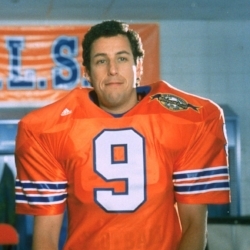 Look for him to come up on top in a competition with Teddy Bridgewater for "shittiest knee". Fun fact: In 2005, Aaron Rodgers was drafted 24th overall instead of 1st for some reason. We at Football & Stuff anticipate another season of him being a cool guy who's pretty good at football. Maybe he'll have a kid with Olivia Munn soon! I wish I was that kid. Now in his 4th or 5th year behind center in Kansas City, Steve Carell will probably retire soon without fanfare. This may be the most exciting prospect this year. Although lacking the football acumen of his progenitor (dare we say... father?) Eli Manning promises to intrigue scientists for decades. Can you quantify the intensity of a frown? When will he turn back into goo? These things we can not know.